You’ve written a great equestrian novel. Its characters ride like demons, their horses leap off the page, and your scenes explode with action. The ending is mind blowing. It leaves your readers breathless for more. Now all you need a cover. Okay, let’s back up for a minute. If you have a publisher who’s calling the shots, you probably won’t have much input on this. You’ll be at the mercy of an art department’s hurried choice of a horse doing something . . . whatever strikes their fancy, whether it’s appropriate for your book or not. Most people (especially editors and art directors at major publishing houses) don’t know a horse from a hamster, never mind the nuances of a horse’s reaction to a given situation. Have you ever looked at covers for equestrian fiction? Most are cringe-worthy. It’s the rare publisher who gets it right, never mind frantic phone calls and emails from horsey authors who know what their books’ covers ought to be depicting. Case in point: Several years ago a big NY publisher was preparing to release my friend’s debut equestrian novel. They sent her the cover, as a formality, and she hit the roof. Hardly surprising, given the photo showed a woman in a flimsy nightgown with bare feet leading a droopy-eared horse from the wrong side. Fortunately, the author’s agent went to bat for her and they got the cover changed. I wrote my first children’s horse book for Weekly Reader, a long time ago. They allowed me to choose the illustrator for the cover and interior art, and it worked out superbly well because the artist was a horsewoman. Then came a series of middle-grade horse books for Troll (now an imprint of Scholastic) that I developed with Jane Stine at Parachute Press (they produced Goosebumps). Again, it was a positive experience because Jane listened to my concerns over the visual parts of the stories. Fast forward to the early 2000s. By this time I’d switched, temporarily, to writing women’s fiction and my debut novel, Beachcombing, was published by Macmillan in 2009 (it had nothing to do with horses). They sent me a PDF of the cover art—I was fine with it—but they’d changed the book’s title from my original (Painting Naked) to their choice, Beachcombing. I argued, and lost. These days, publishing is a moving target—much like the fashion industry. I have wide feet, so I’ve learned the hard way that sometimes it’s best to buy shoes first, then choose an outfit to go with them—kind of like picking a cover for your book before you begin the story. This way you can make sure things match up. How many times have you read a novel about horses where there’s not a dapple gray in the entire story, nor a woman with white-blond hair, yet that’s what appears on the cover? When writing for kids, it’s even more important to get these details right. Those eagle-eyed, horsecrazy eleven-year-olds will be all over you if you mess up. However, with a little judicious tweaking, you can always make your story fit the photo you’ve fallen in love with. But don’t do it unless it’s absolutely right. Just be sure that whatever appears on the outside, reflects what’s happening on inside, and give yourself double brownie points if it doesn’t pinch your toes. So, the whole point of this is: Choose your cover art, early in the process, and run it by people whose opinions you trust. After finishing book two of my new middle-grade horse series, I thought I’d found the perfect cover photograph to depict a dramatic scene near the beginning of the story. The photo had it all—the right color horse, doing the right stuff … all the way down to the gloves worn by the woman wrestling with it—till I shared my Photoshop masterpiece with several horsey friends and asked for their opinion. The criticisms were legion, and they were right. I had no answers to these very pertinent questions. In the actual story, the woman in this scene was in normal barn attire—jeans, t-shirt, and riding boots, not white breeches and hunt jacket. And, as a professional trainer, she would’ve known better than to leave a trail of lunge line pooling at her feet. But for a moment, this particular photograph struck a cord with me and painted what I thought was a perfect picture. It’s these mad moments of wanting the shoes to fit that need to be wrestled into perspective. No matter how many miles you walk, they will always remind your feet who’s the boss. The moral of all this? If you have a choice of cover art, trust the instincts of your horse-loving friends. They will give your reins a sharp tug … to say nothing of laughing themselves silly over those sparkly, five-inch-heel heel muck boots you found on e-Bay. 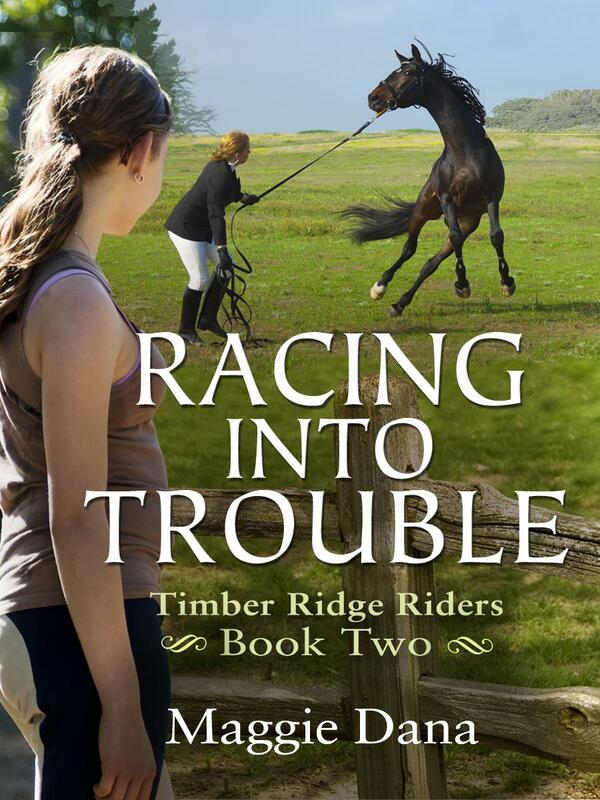 Thanks to invaluable input like this, here is my final cover art for Racing into Trouble, Book Two of my Timber Ridge Riders series. Big improvement…except for the hole in her pants. Can’t wait to read it! I kind of like the hole. It shows me she rides with her seat! I love it. I loved the first one, because the horse is SO dynamic, but I can see the points that the others are making… which is a good example of checking with MULTIPLE people before you make your decision, I suppose. The worst cover art in the world shows up on the current reprints of The Black Stallion series. They don’t even LOOK like horses. Bad photo-stock of horses is one thing; the PAINTINGS that cover artists do of horses are a million-billion times worse. I love that second and final cover, Maggie! Wonderful! A non-horsey person like myself (frankly, I’m a little afraid of horses) would never have caught those nuances but you are smart to know your audience, because your audience WILL know and WILL give you an earful! Thanks, everyone for the kind comments. 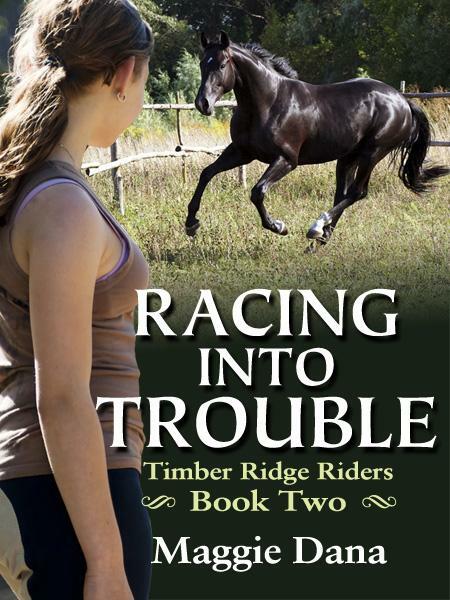 I was all set to go with the first cover till a non-horsy writer friend asked why that woman was torturing the horse. She wasn’t, but that’s what it looked like to someone who doesn’t know horses. This is what triggered my own doubts, so I sent it to people who know and understand horses and they picked up on a bunch of different stuff that wasn’t working, either. The nice thing about working with a small press is that I got a lot of say in choosing my illustrator…who READ the book and is a horse person, so the illustrations and cover images were perfect. It’s amazing how much goes into cover design! Great post. Great, entertaining, and informative. Bravo!